My most recent sewing project that I’m sharing today actually preempts the previous project I finished just before this one. You see, I planned to take photos of both the same day, except there was 2 inches of snow on the ground and I could only stand being outside without a coat for so long. So you’ll have to wait on the other one. Look what I did for the love of this blog, my friends! I braved the cold and snow (and dodgy lighting—sorry). I wanted an 8-gore skirt just to try something different, so I used the pieces of this Hollywood Patterns dress (pattern 407) and added a waistband. 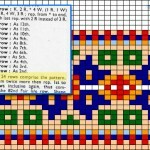 I’m nearly positive the pattern is from 1940. My sleuthing led me to Hollywood 402, just a few numbers down from my pattern. It featured “Betty Grable of 20th Century Fox” on the cover, and looking it up, she only joined 20th Century Fox in 1940, so it couldn’t be earlier. 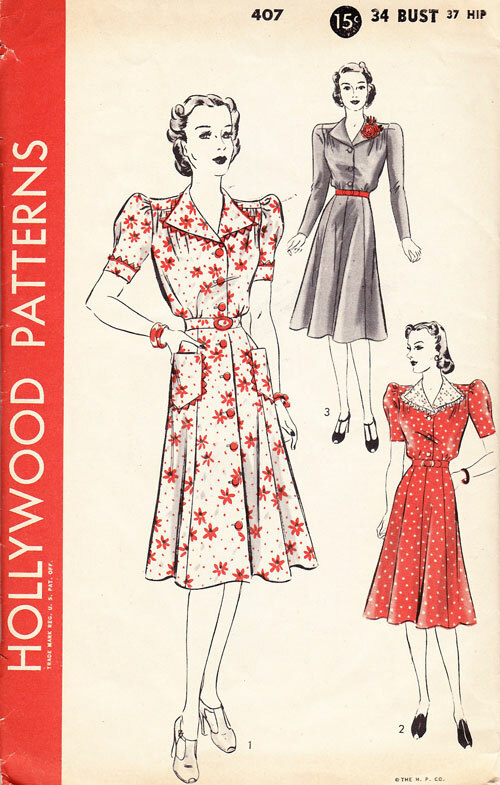 The November 1940 Hollywood Pattern catalog has similar styles but numbers already in the 500s, the June 1941 catalog is going on into the 600s, so I figured it couldn’t be later. So I bet this was from spring or summer 1940. The art of skillfully cutting length off skirt pieces still rather eludes me. I had to cut off about 7″, about my norm. Folding the pattern pieces around the hip-level and re-drafting the side seams would have dramatically altered the width of all those gores (making the skirt much wider), but taking it from the hem would make a much less full hem. In the end I decided just to cut from the hem. Maybe I’ll split the difference next time. It still falls pretty nicely. Would any (non-experts) sewists be interested in a post on my new favorite hemming techniques for using rayon seam binding and an a-line skirt? I was personally having some frustrations with getting it to look good on the inside until recently when I hit on just the perfect series of steps (using vintage resources as my guide). I graded the pattern pieces down slightly to try and get a bit of a better fit in the waist but I went overboard, and after attaching the waistband realized it was too small. It fit, but it was a don’t eat, don’t breath kind of skirt. So I unpicked the waistband, let out several seams and re-cut the waistband. Now it’s perfect. Fortunately I foreaw that it might happen so I serged the seam allowances separately and pressed them open un-trimmed, otherwise I would have been sunk! I may repeat that in the future just in case. Anyway, because I couldn’t leave well enough alone, halfway through the project I decided I wanted to make detachable pinafore straps. They’re held on with red buttons on the inside that only I get to see. For the straps, it was easy: I measured up and over my shoulder diagonally from back waist to front waist, added a few inches for insurance, and cut one piece for each strap twice the finished width I wanted for the straps (2″) plus seam allowances. I interfaced, sewed up a back center seam and turned the tubes right side out (the interfacing proved a bit of a problem turning them but it’s okay in the end). Then I pressed, top-stitched about 1/4″ in from each edge, serged one raw edge and measured for buttonhole placement on the back. Once I had the straps buttoned in the back I flipped them to the front, marked buttonhole placement while wearing it, cut off the excess fabric, serged that raw edge and made the front buttonholes. But I’ll probably wear it more as a skirt because in weather when I want a wool skirt, I also want a sweater. Maybe it would work with a fitted pullover? Taking photos in the snow wasn’t so bad, but let’s be honest, it went a little more like this. 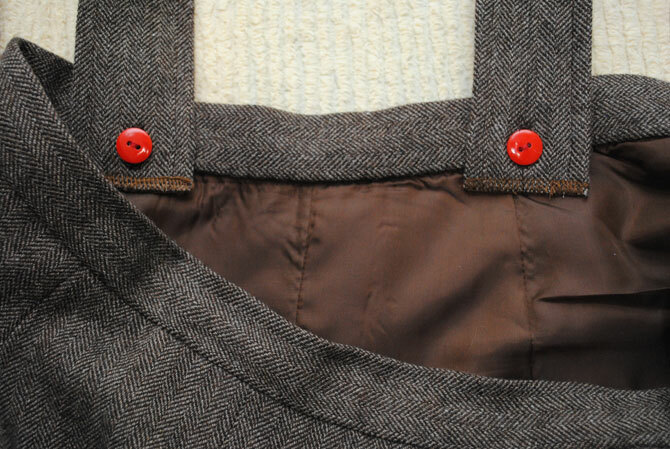 It’s a classic—a basic wool tweed skirt with removeable straps to transform it into a pinafore whenever I want. I love it. I’m already pretty sure I’ll be wearing this all the time! You look fantastic! I absolutely love pinafores, but never thought to sew one myself. Love the opera gloves, what a great idea. For lining, I always always suggest Bemberg Rayon. It’s pretty cheap – I think $6 or $7 a yard at the Vogue store – and comes in all kinds of awesome colors. And it feels amazing against the skin. Thanks Lauren! And bummer about your pants, sniff sniff. 🙁 I hope you can work it out! That’s good to know the price point of Bemberg Rayon isn’t bad at all! I always wear a slip, so lining goes into new territory for me. Oh, I love this! I’ve been toying with the idea of making a pinafore for ages now but I’ve never had the gumption to try it. This looks FANTASTIC on you and you did a really great job with it. And I’d love to see a tutorial on the rayon seam binding. I must admit I often rush my hems. I’m suffer from racehorse-near-the-finish-line syndrome and get so excited that I’m almost done, I often just do whatever is quickest. Sometimes the fabric and skirt are forgiving, but other times it’s not so much. Oh, and as a fellow shortie, I always take length off the bottom of my skirts. It does often result in a less full shirt, but I find that the fullness often “corrects” itself for my shorter legs. When I’ve taken length out from the middle, it’s usually resulted in a skirt that was much too full for my midgety stature. I know what you mean–by the time I get to the hem I just want to be done. That’s a good point about the fullness and short legs. I think that’s why I usually feel like circle skirts just overwhelm me, much as I’d love to wear more of them! Absolutely perfect! And I love the grey tweed with the blue. You always TOTALLY make me wish that I could sew. Wow!!! Perfection at its best. I also love the snow it looks so inviting. As for the hemming tutorial,yes, I would be interested. this is lovely! i really like the snowy picture, you look as happy as a kid in the first snow. As lining goes, I really like bemberg rayon (after lots of researching, i found out that what i buy here in sweden and is called cupro is actually bemberg. And i’d love a tutorial on hemming! p.s. that’s a super fabulous hat!! Did you make it? I love this! Such a great idea to make detachable pinafore suspenders! I am also loving your vintage snow/rain boots!! What a great skirt! Clever to make it convertible. The gloves are pretty rad too. Very cute and such a great idea to have detachable straps to make it more versatile – genius! Fabulous job–I love that tweed fabric! LOVE IT!!! I sewed a pinafore skirt for Mary at the beginning of her school year (August) and she has yet to wear it…I thought nobody was too old for back-to-school clothes. Once I photograph it, I’ll be sure to post it. Your sewing never fails to impress and you are on a roll! Keep it up! This is such a marvelous piece! 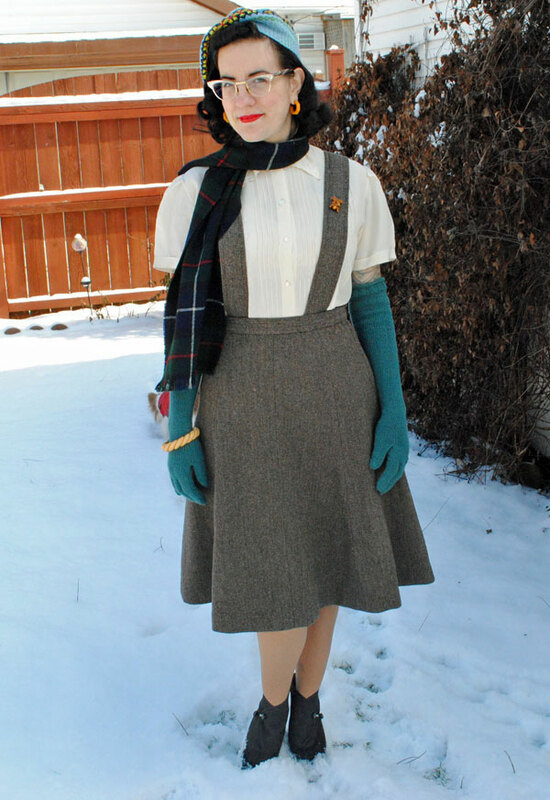 I love that you used that delicious tweed, and I especially love that you added the fabulous straps – I think they make this skirt into something really special. The whole ensemble is pretty fantastic – I found myself drooling over your gloves! Love your outfit! What I really love is these long wool gloves, I have been searching a pair like these for years. I’m really fed up of snow now… I’m waiting for sunny spring! Gorgeous!!! I love pinafore skirts. I have seen some awesome reproduction ones but after seeing this I think I will just make one myself. Ooh maybe this is what I can do for Lucky Lucille’s 40s sew-a-long. Thanks for the inspiration! You look lovely in your new skirt. You look divine! I was super in love with the pinafore instantly but then the gloves! They’re so lovely and perfect! You look awesome. You look lovely! I wish it snowed here, it looks so pretty! I am short so usually take a sh*tload off the length of my skirts. The way I do it is fold the pattern pieces about mid-thigh. Then I true (or just fold over) the excess and it keeps the circumference of the hem of the skirt. However, this changes the angle slightly of the flare. So there will always be a compromise made unless you draft your own pattern (which I can’t be bothered with to be honest!). I guess they work out the same? But as Moe said, smaller person should equal smaller fullness as too much volume in fabric will overwhelm the frame. I love everything about this! 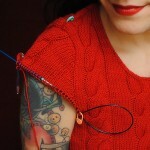 I’ve never sewed something from a pattern yet – it is on my list though! The fair isle is beanie all kinds of wonderful too! You have no idea how much I love this look!! I am pretty sure I could totally steal your wardrobe (not sure it would fit though). I love the gloves too – what pattern are they? Looks like my mom didn’t post the pattern on her Ravelry page, I’ll have to ask! Outside at winter in short sleeves… brrr! You are a very brace lady! What an absolutely stellar outfit and pinafore skirt! Great minds at work here, I must say, because this skirt style has been on my mind heavily for the past few weeks, too. Bettie Page clothing offers a somewhat similar style in three colours, and I’m hoping to add at least one of them to my wardrobe this year. You truly look fantastic, dear Tasha, thank you for sharing your this awesome sewing project with us. Oh I love it and the removable straps..how cool is that!! Ahhhh, so you have the snowy weather now! 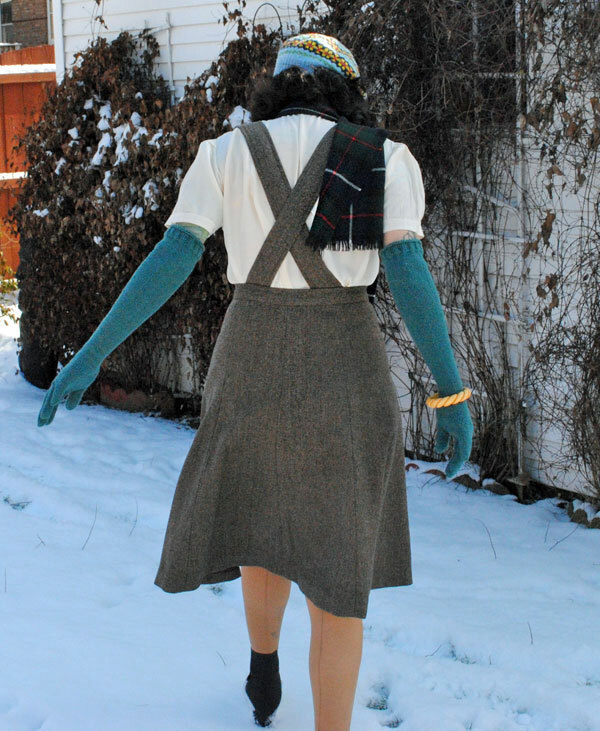 That pinafore/skirt is sooo lovely, and the perfect material for wintery weather too…I want one! I am also loving those galoshes! Yes, you’ve passed it back across the ocean the opposite way now! lol We even have tons more on the ground since the weekend! That is SO cute. You’re lucky to have a mom that knits you amazing gloves! 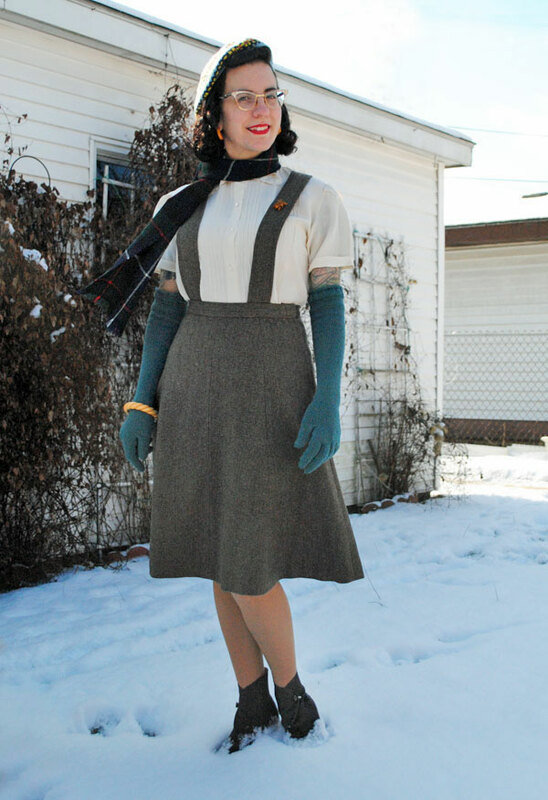 The gloves are an excellent idea – and the skirt is so darling. Will you please share your favorite red lipstick colors/brands including the one you are wearing in this photoshoot? Thanks in advance!